Smt. 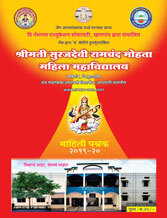 Surajdevi Ramchand Mohata Mahila Mahavidyalaya started in the year 1989. If Woman in the family is educated the whole family is educated & cultural by her same was the mission in opening the college specially for women. Dr. Swati Chande became the Principal of the college from the session 2015-2016. College is strongly progressing under her able guidance keeping in the mind the need of women students coming from pertinent villages the college Building is standing in the centre of this Silver city with all required facilities. Arts & Commerce Education is rendered up to graduate level through mother tongue of maximum students i.e. Marathi Medium. Post Graduation is HEC is also available for the cream & studious students. All the teaching staff members are highly qualified. Various vocational courses are also run under UGC Schemes for self employment. Library is the heart of any Educational Institution. Separate & well equipped Library with all types of Books, Journals & digital facilities is made available for the students. Computerized & digital class rooms. Laboratories for HEC & MUS. Sports facilities for Physical Education. Jeam facility for students of Aerobics. Well equipped Auditorium for cultural & entertainment programmes. Play ground facility is made available for the outdoor sports activities in collaboration with some social Institutions. Strong support from the Management i.e the National Education Society is the key of the progress of this women’s college in the backward distinct if Vidarbha region. All the Subjects which are taught in the college form their study circles to enhance the co-curricular & cultural activities such as seminars, speeches of studied personalities, essay writing competitions, Music competitions, sports activities etc. Various social activities are organized by the NSS Deptt. SGBAU has taken the cognizance of the same by awarding Best NSS women programme officer to Dr. Triveni Sonone our Ex-Principal & appointing Area co-ordination to Dr. Vasant Dongare & this year to Prof. Chhaya Jadhao . Library :- Separate & well equipped Library with latest Books, Reference Books, Journals, various News Papers, weekly journals, Reading Room, Separate arrangements for Research acitivities is provided. Alumni Association :- Alumni Association has been formed & registered. Many students are well in contact with the college. They participate in college activities. College also invites them as chief Guests at various functions such as study circle inaugurations felicitation programmes of Meritorious students etc. Alumni Association organizes Alumni Meet every year. Research Work :- Principal & Eight other faculties are Ph.D holder, three are M.Phil in their subjects, two faculties have registered their names for Ph.D. & their work is in progress. Two faculties have submitted their MRPS to UGC & One MRP is in progress. Three faculties are Ph.D supervisors. All the faculties participate in various National, International & State level conferences. Their paper have been published in many souvenirs. So the Research activity of our college is commendable. Vehicle Stand :- The facility of Vehicle stand has been provided to students & staff members. The facility of co-operative Society for the Staff has been provided by the NES. Physical Education & Recreation Deptt. :- Physical , Mental, Psychological & cultural development is very important for the alround development. Yoga classes, Aerobics & Sports facilities are provided by the Deptt. of Physical Education Students participate enthusiastically various sports, cultural activities, Youth festival etc. organized by SGBAU & affiliated colleges. Compettive Examinations & Vocational Guidance Cell. Along with regular courses a separate cell for guidance of competitive Examination is very active for the sake of self Employment vocational Guidance cell also work actively. This cell organizes Guests lectures General Knowledge tests etc. This cell has its separate Library of General knowledge Book. Competitive Examination Books & journals etc. Students take the expected benefit. National Education Society has provided a grant Computer Laboratory , well trained faculties for all students. Still a separate computer facility & Language Laboratory is provided by the college for the students of Functional English , Fashion Designing and B.Com I, II students.